Dave Morgan looks ahead to garden openings across the Village area. Call me an old cynic if you like, but when anyone tells me they have a great opportunity for me, I assume there is a catch – and there often is! However, in the case of gardens opening for the NGS (the National Garden Scheme) the opportunity is to view some of the best gardens in the county, enjoy a cup of tea or coffee and a piece of delicious homemade cake – and often buy a plant or two at very reasonable prices. You may also pick up a few gardening tips and ideas shared by the garden owners! The catch? Well – apart from paying the entrance fee, there isn’t one. Added to which by visiting the gardens open under the scheme you will be supporting charities such as Macmillan Nurses, Marie Curie, and Parkinson’s UK. Last year the NGS gave over £3 million to these and a few other organisations, all of which was raised by folks visiting local gardens and enjoying a great day out in an English garden. How’s that for a great opportunity? What’s more, you don’t have to travel far for some amazing gardens – and indeed some that don’t open every year – so it’s a good opportunity to visit them while they are open. This year gardens attached to no fewer than eight properties in the small hamlet of Withybed Green will be open to the public on Sunday June 30 from 1 until 6pm. Worth putting that in your diary as these gardens only normally open every two years, and this year includes two brand new gardens: 1 Front Cottages and 1 Rear Cottages. 1 Front Cottages has a small garden with patio, summer house, lawn, borders and a variety of plants in containers. In contrast, 1 Rear Cottages is only really starting out on its journey as a garden, in that it is effectively a blank canvas at the moment – with just a log cabin that has been built to get even closer to the countryside views that surround the property. However, owners David and Serena have a vision of what they want the garden to look like and it will be interesting for visitors to see it now and then again in two years’ time when Withybed Green, hopefully, will be open again. Among the other gardens open in the hamlet are a number of other small cottage gardens plus some considerably larger ones, including one very well-respected rose garden that has been featured on TV gardening programmes such as Gardeners’ World. Another local opportunity this year is at Marlbrook Gardens. 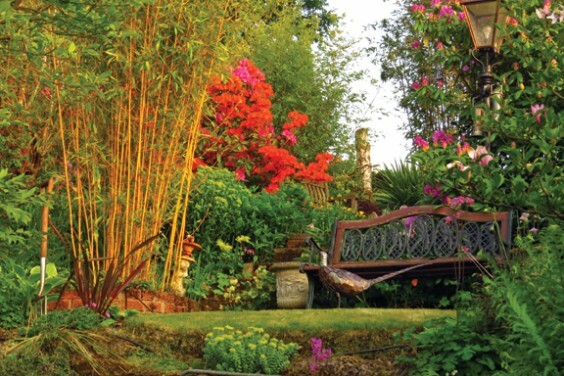 This group, which for many years included three separate but very different gardens, was reduced to two five years ago when John and Janet Morgan decided to retire their garden, Saranacris, from the NGS. After last year’s opening, garden owners Alan and Lynn Nokes, of Round Hill Garden, also decided to retire from the scheme due to health issues. However, John and Janet have now decided to re-open their garden – possibly for one last year. So not an opportunity to miss! Saranacris (pictured) is a small but unusual and steeply sloping garden created in a former sand quarry by the owners. It’s a plantsman’s garden crammed full of a wide range of plants, where you will find well-loved favourites growing among the rare and unusual. Water is the theme throughout, with a stream, waterfall and koi pond as well as a number of small informal ponds and water features. Overall, the garden is designed in rooms separated by a range of natural features or informal planting and a network of paths allows the visitor to wander around in differing ways opening up a variety of views and vistas. There is a glasshouse on the patio planted with a range of semi-hardy plants; examples include gingers, Abutilon and a large Tibouchina with its wonderful purple blooms in late summer. Another feature of the garden is the roof terrace and conservatory, primarily home to John’s collection of gingers, accessed from the patio via a spiral staircase. Visitors can sit and linger on the roof terrace with refreshments while taking in this mid-level view of the garden. The other garden in the Marlbrook group is Oak Tree House, which will also open on its own in May for an evening opening with wine for the visitors, whereas the two gardens together will open on July 21.